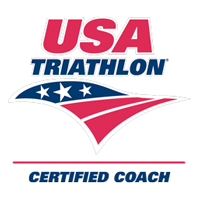 Randy is an USA Triathlon level 1 and USA Cycling level 3 certified coach and has helped athletes of various abilities and experience achieve their goals. He is an 8 time Boston Marathon qualifier (7 time finisher with number 8 in 2017) and has completed numerous marathons, (10 Chicago and more), Ironman, (3 IM Wisconsin and 1 IM Texas) and many 70.3's, and ultra endurance events. His triathlon pursuits earned him USA Triathlon All American Honorable mention, Ironman Silver Level All American awards, and two time qualifier for the USA Triathlon Age Group National Championships. He draws on his personal experiences with weight loss (60 pounds), numerous marathons, Ironman and ultra endurance races to help his athletes succeed. Randy believes that all personal and athletic achievement begins with the all important, “first step,” and he inspires people to have the confidence to take that big first step and reach for their life and athletic goals. ​Randy is also a running coach for Team PAWS Chicago.